Players use the soldiers, heroes and demigods of Greek mythology to battle their opponent! By playing cards to take control of Troy, Olympus and the Delphic Oracle, as you recruit heroes and demi-gods of legend, such as Heracles, Hector and Achilles to increase your capabilities and inch closer to victory! Strive for a military victory or overwhelm your opponent by controlling all of the locations on the board. Win an exciting duel and become the master of the Greek pantheon! Part of the Lookout Games 2-player series. 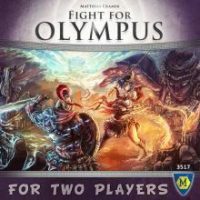 Add a Review for "Fight For Olympus"